Product prices and availability are accurate as of 2019-04-20 21:12:48 BST and are subject to change. Any price and availability information displayed on http://www.amazon.com/ at the time of purchase will apply to the purchase of this product. Working priciple: Power: Mains voltage: Inputs: Outputs: Output voltages Frequency responce: Distortion: Noise: Output impedance: Sampling rate: Dimensions: Weight: Non oversampling dac. Forward (FPGA) fixed, 4 Dacs professional channel in differential mode. 45 VA by means of 3 apart torodial transformers. 110/115V Air Conditioner 220/230V Air Conditioner 60/50Hz 1x optical, 2x coaxial (1x BNC and 1x RCA). AES/EBU and USB 2x RCA Neutrik Â© cinch connectors. 2x XLR well balanced output. RCA: 2 Volts RMS. XLR: 4 Volts RMS 1Hz - 20 khz -2.5 dB. 44.1 kHz sampling. 1Hz - 65 kHz - 3dB.192 and 384kHz (USB) 0.01 % THD -145 dB related to 2 Volt RMS RCA 100 Ohm. XLR 200 Ohm Optical 44.1 - 96 kHz sampling rate. Coax and AES/EBU: 44.1 -192 kHz. USB 44.1 - 384kHz sampling rate 440 x 320 x 85 mm. 10 kg. With that goal of creating a very special DAC in mind the designer, Cees Ruijtenberg, has during the past year developed a new DAC. 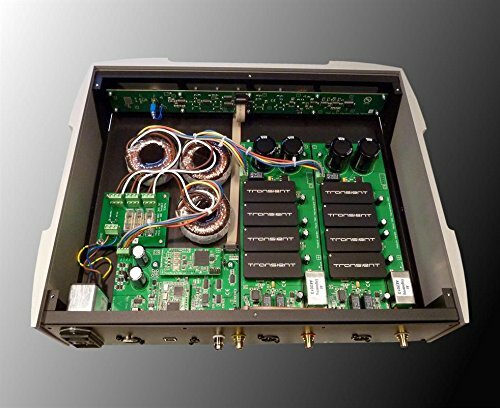 It was an unprecedented challenge, which was eventually solved by introducing an entirely new chip, which has been exclusively developed by Metrum Acoustics. In short, the Pavane is a DAC that has taken all the lessons and experiences that her designer has learned over the years, and combined them in an ambitious DAC that can fit in every system. It is musical, honours the Non-oversampling principle while simultaneously incorporating the technological progress that has been made over the years The Pavane is available in black or silver. The used top panel is a sandwich of steel and 4 millimeters of tempered black coated glass and gives the Pavane very distinctive looks The Pavane is build up with a double well damped frame and will avoid vibrations due to the use of bituminous material. Around this strong body beautiful shaped aluminum panels are used to make it even stronger. The choosen approach masks the use of screws from most important directions As standard a remote will be delivered to control the available digital inputs. Behind the luxurious front more than new chips are concealed: The parallel driven R2R ladder networks as used in the eight DAC modules performs , especially when combined with our FPGA-driven "forward correction module", on a higher level. This module splits up the audio samples for each channel into new separate data streams. Each dac cluster processes a portion of the data in the most linear region of the dac chips. The result of this process is an extremely high linearity, right down to -140 dB, which gives the Pavane a realistic 24 bit dynamic range. Due to the dual mono design over the entire frequency range an extremely high channel separation of 120 dB is realized. This contributes to the flawless positioning of instruments.